When you listened to CJOB radio broadcasts of the early Winnipeg Jets, I was the usually the guy sitting behind the console at the station. I enjoyed listening to the Voice of the Jets night after night. And the Jets were great, too! I listened to an awful lot of hockey in the early 1970’s. Back then, I did the evening show at CJOB four nights a week. And that’s when the Jets played most of their games, which meant that I got to produce the broadcast, especially when he was on the road. Which meant helping Ken Nicholson get the show on the air and keep track of all the commercial breaks. 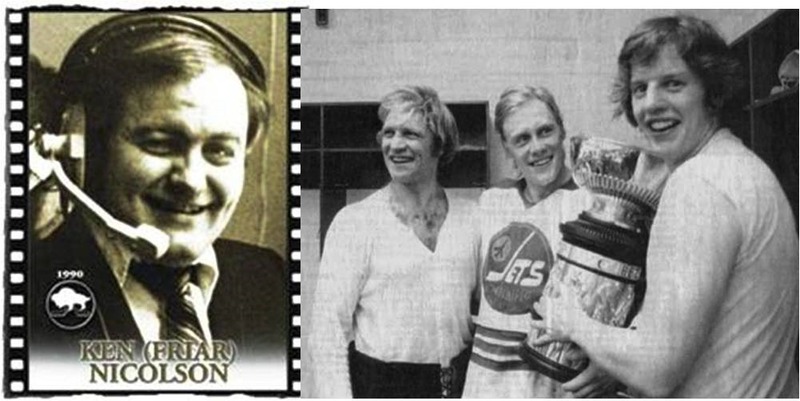 Ken was the CJOB Sports Director at the time, and he leaped at the chance to be the Voice of the Jets. He was all in, committed and tireless. And an absolutely great person. When Bobby Hull arrived in 1972, everyone in Winnipeg was excited. Before then, we had to make do with Hockey Night in Canada on TV (remember Murray Westgate?) and one or two NHL exhibition games in September, usually the Maple Leafs. Now we got to cheer for our own team, and they were pretty good right off the bat. It was Normie Beaudin who was actually the Jet’s first signing, joining Hull and Chris Bordeleau on the top line. But things really got interesting when the Swedes arrived in 1974. Anders Hedberg and Ulf Nilsson formed The Hot Line with Bobby Hull, while Lars-Erik Sjöberg played defense and captained the team. The Voice of the Jets was continually challenged over pronouncing the Swedish names. I remember an early interview when Ken asked Lars-Erik about that. His response was that the final “g” in his and Ander’s names was pronounced “ber-yeh” or an unstressed “y” like in “yes”. Unfortunately, Ken came away with a stressed “y” like in “berry”, and we chuckled and lived with that for a few years. Perhaps there were not too many Swedish names to pronounce in “Tunder” Bay. As with now, professional hockey teams play half their games on the road. Many of the arenas in the WHA did not have great facilities for sports broadcasting. Sometimes the view from the booth was limited. Frequently, the booths were not heated. I know there were times that Ken kept his coat and gloves on. Plus, it was usually an arduous climb to get up to the broadcast booth, and sometimes that meant wandering across narrow catwalks. Fortunately, Ken seemed okay with heights. For the home games we had dedicated good quality phone lines plus our local technician would help get things set up, produce the broadcast and troubleshoot any problems. On the road, though, Ken was definitely one man on a mission. In the early years, the “away” equipment kit was simply Ken’s headset microphone (see above), a second guest microphone, a Sony cassette recorder, a Shure M67 mixer, and a cable to plug the mixer into a telephone line. He would usually pre-record some interviews before the game and play these back during intermission from his cassette machine. (A guy has to go to the bathroom at some point!) Typically, Ken would also be joined by guests for interviews or provide color commentary. These sports guys were great at social networking and helping each other out on the road. The telephone line had to be booked in advance to send a dedicated audio signal back to Winnipeg. In the early years, this was often what they called a “hybrid” line. Hybrids gave us the ability to talk to Ken over one side of the circuit, while he broadcast on the other side of the circuit. Sometimes these special lines failed (or failed to get installed) and Ken had to use a plain old telephone. He carried a pair of alligator leads so he could clip his mixer to a microphone connection in the phone by removing the mouthpiece. One way or another, I don’t think technical challenges ever prevented the Voice of the Jets from getting the game on the air. One last technical note. Even though we used ordinary (bandwidth limited) phone lines for the remote broadcast, we were able to make them sound good by using a frequency extender. This used to be an electronic shifting and mixing technique to get high-fidelity audio out of an ordinary phone line. Of course, it’s all digital now. Ken “Friar” Nicholson, the Voice of the Jets, did more than a thousand play-by-play broadcasts before his untimely passing in 1992. I remember him fondly. Here’s a great video tribute for you to enjoy. Power System Hacks – Unlikely, Possible, Probable? Your address will be kept private.